I've posted this recipe before and it's one of my favorite stir-fries. Sometimes I make it myself and now-and--again I order it from a local restaurant. But, as often is the case, I'm jumping ahead. Last evening I was stressed; over a few things but basically that I had too much to do and not enough time to do it. And often when I'm stressed it leads to melancholy. I had cooked and rushed around a kitchen (at work) all day, and had some studying and writing to do besides things around the house. I knew it was impossible to fit it all in that evening. And when I'm stressed I also tend to procrastinate. So that evening I went to the health club for a quick swim and a long steam. And as I sat in the steam room I thought of dinner...I'll stop on my way home and pick up a portion of Broccoli-and-bean curd from a local restaurant, I thought. And as I pedaled and coasted home--and was really not feeling like doing the chores ahead of me--I remembered that I still had broccoli growing in my backyard (pictured below) and some tofu in my fridge. So instead of doing the chores I had planned I went home and cooked. I cook all day at work for other people and sometimes it really feels good to simply cook for myself. Cooking, in the right conditions, can in fact be therapeutic (click here). So I poured myself a glass of wine and went in the backyard with my dogs to pick broccoli. It was already dark and a beautiful crisp autumn evening. So before cutting the broccoli I sat on a stool while my dogs wandered, sniffed, snorted, and peed the entire perimeter of the backyard (the garden is fenced off). I sipped my wine while I looked at the stars above. It felt good to be outside with a slight chill in the air. After cutting the broccoli I went in and prepared my meal in a mindful way. As I sliced the broccoli I remembered pushing the tiny seedlings into the moist, cold ground some months earlier with the promise of summer ahead. I utilized all my senses as the tofu cooked and sputtered in the hot fat. I sipped wine and listened to NPR while I cooked. Things are good, I thought, and I skipped most of the chores I was to do that evening. Instead I watched a movie while I ate. The food tasted good--really good--and I was glad that I prepared it myself (for myself) instead of purchasing it. It was, I thought, just what I needed. (This is a classic vegetarian dish but ti would be equally delicious with thin slices of chicken breast, pork, or shrimp). In a small bowl combine the soy sauce, vinegar, sugar, and cornstarch. Mix to dissolve the cornstarch and set aside. 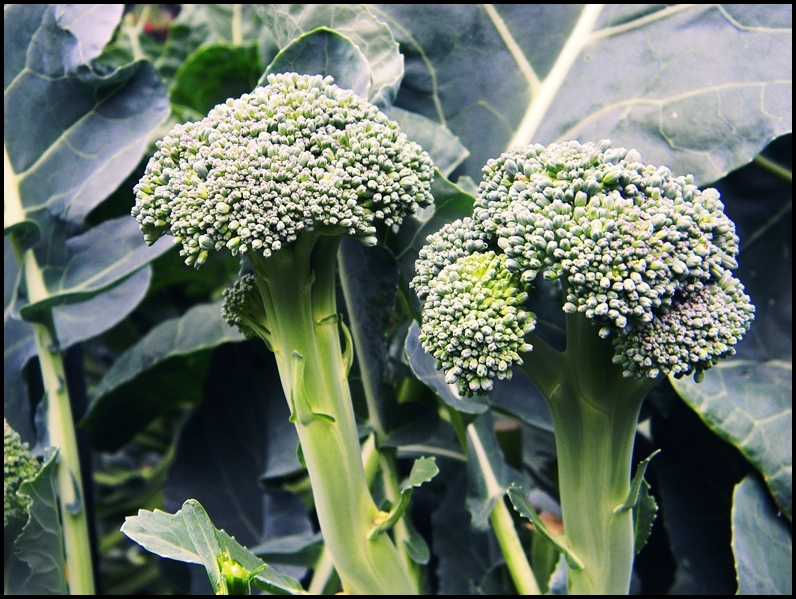 Par-cook the broccoli in boiling water, then drain it and cool it under cold running water. Heat the oil over medium-high heat in a large skillet. Carefully add the tofu and cook it on both sides until golden brown. Remove the tofu and transfer to absorbent paper. Carefully pour most of the oil into a separate pan (or other safe container), leaving just enough oil to stir fry in. Heat the pan and add the onion and bell pepper. Sauté the vegetables until they begin to caramelize. Add the garlic, ginger, and hot peppers. Sauté for another minute or two. Stir in the chicken broth; bring it to a boil, then stir in the soy-cornstarch mixture. 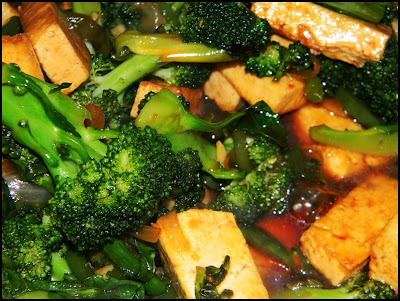 Bring it to a simmer, then add the broccoli and bean curd. Stir and toss it to evenly coat it with sauce. Continue to heat the pan just until the broccoli is heated throughout.